Unlock criteria Clear the Playing Tricks event. Smashville (すま村, Smash Village) is a stage in Super Smash Bros. Brawl, Super Smash Bros. for Wii U and Super Smash Bros. Ultimate based on the Animal Crossing franchise. Players battle on a platform with a moving horizontal jump-through platform suspended above an Animal Crossing town while spectators watch on. Villager is fought here for his unlocking battle in Ultimate. Smashville's only dynamic element is a floating soft platform that moves from side to side over the stage. 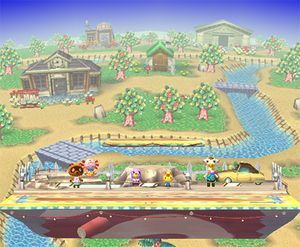 The stage is home to numerous background characters from the Animal Crossing series, and features a day-night cycle that runs according to the console's internal clock. On Saturday evenings from 8:00 PM to 12:00 AM, K.K. Slider will appear in the background performing a concert. Other background characters spectate the fight, reacting to KOs and visibly favoring one fighter or another. Small, red balloons sometimes float overhead, carrying food items if they are enabled (even if the overall item frequency is set to "none"). The balloons can be popped with one hit. Moves that change once hitting a hurtbox will interact with the balloons, such as Bouncing Fish. Turning stage hazards off in Ultimate will keep the moving platform in one place, and balloons will no longer appear. In Super Smash Bros. for Wii U, the moving platform, background characters, and balloons do not appear in the Ω form. Additionally, the stage is increased in length somewhat to match that of Final Destination. In Super Smash Bros. Ultimate, the Ω form and Battlefield form are similar to SSB4's Ω form; however, the main platform is resized and reshaped to match Final Destination and Battlefield, respectively. The three soft platforms of the Battlefield form are based on the soft platform of the normal form. At least one human villager will always appear. Copper and Booker always appear together, as do Katie and Kaitlyn. Sable and Mabel are likely (but not guaranteed) to appear together, as are Blathers and Celeste. Gracie and Brewster both occupy the right side of the stage, so they are mutually exclusive. Tortimer and Cornimer never appear together; neither do Pelly and Phyllis. Only one of the Nooklings can appear at a time. Tom Nook can appear in any of his four outfits. During the day, Blathers and Celeste will be asleep, just like in Animal Crossing itself. The Town Hall, one of the iconic facilities in Animal Crossing that appears on the stage. Animal Crossing A clothing and tailoring shop, where the player can design their own clothing and umbrellas. Animal Forest The residences of the non-playable villager characters. Animal Crossing An initially-empty museum, which can be filled by the player by donating bugs, fish, fossils, and works of art. It also includes an observatory, where constellations can be designed, and The Roost, a coffee shop. Animal Forest The player's residence, which can be expanded and decorated with wallpaper, carpeting, and furniture. 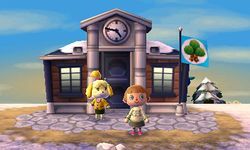 Animal Crossing: Wild World The main building for the town's civic duties; the player can pay their debt to Tom Nook, deposit and withdraw money, mail letters, dispose of unwanted items, etc. Strangely, despite Tom Nook's store being one of the most important buildings in the Animal Crossing series, not one version is present in this stage. The background also contains elements that occasionally appear, such as the taxi driven by Kapp'n, who drops players off at the Town Hall; a flying saucer flown by Gulliver, a seagull astronaut; and Pete, a pelican mailman, flying across the background. At night, constellations can be seen in the sky, similar to the constellations that can be designed by the player at the museum's observatory. In Animal Crossing, there are balloons that occasionally float over the town carrying a present. In Wild World onwards, if the player has a slingshot, they can use it to pop the balloon. In the original Animal Crossing, they instead must wait for it to fly into a tree, then shake it out. This stage features balloons that pop when attacked, and, if items are enabled, carry food. In Animal Crossing, there is a dog musician named K.K. Slider, who performs every Saturday at 8:00 PM. If the player talks to K.K. Slider, the player can either request a song or ask him to play a random song. In this stage, if the player plays on this stage from 8:00 p.m. to midnight on a Saturday, K.K. Slider can be seen and heard playing one of his songs. The songs that K.K. Slider plays on this stage are real songs that he plays in the Animal Crossing games. The 2017 recommended ruleset for SSB4 also lists this stage as a starter in tournaments, for the same reasons as in Brawl. Most rulesets for Ultimate keep the stage as a starter, as it still lacks any dangerous stage hazards. Added 8-player mode version of the stage and altered existing Ω form to support 8 players (from 6). Smashville in Super Smash Bros. for Wii U.
Wario, Kirby, and Ashley on the stage. The name "Smashville" takes advantage of the fact that, in the Animal Crossing series, players can name their own town, so it is named after the name of the game. Incidentally, it is impossible to name a town "Smashville" in any Animal Crossing game, as "Smashville" is ten letters long, and the maximum number of characters allowed is eight. The Japanese name of the stage, すま村 (Sumamura), is a pun on スマブラ (Sumabura), a Japanese abbreviation of "Smash Bros."
Incidentally, the romanized Japanese name can be the name of a town in Animal Crossing games, being eight letters long. In Brawl and Super Smash Bros. for Wii U, Kapp'n's taxi drives through a tree upon leaving the Town Hall. It stays there for a few seconds before restarting the cycle. This has been fixed in Ultimate by moving the tree out of its path. The Town Hall clock shows the actual time from the console's internal clock. In Brawl and Super Smash Bros. for Wii U, the sign in front of the Able Sister's shop is not translated; it is written in French, as the sign appears in the Japanese versions of Animal Crossing. This has been fixed in Ultimate. If owls Blathers or Celeste are present in the background during the day, they will be asleep. 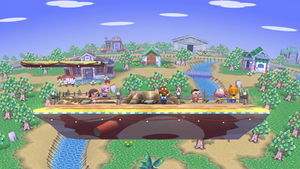 In Super Smash Bros. for Wii U, the Boxing Ring stage lists the Villager's character title as "Mayor of Smashville", a reference to this stage. This is the only past stage in Super Smash Bros. for Wii U that does not use normal crates. 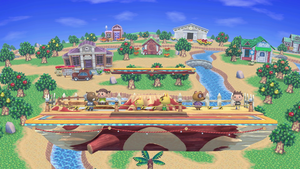 Despite taking several design cues from Animal Crossing: Wild World, the stage's game of origin was changed from Animal Crossing: Wild World to Animal Crossing in Super Smash Bros. for Wii U and Ultimate. This page was last edited on April 16, 2019, at 18:45.